Experienced riders have come to appreciate the Interceptor as one of the best sportbike motorcycles on the road. 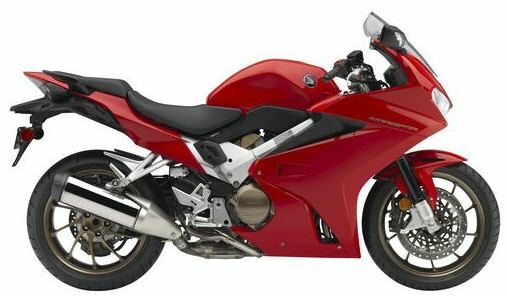 And with the introduction of the VFR800 Deluxe, the best just got even better. With new features including traction control, Anti-Lock Brakes (ABS), self-cancelling turn signals, a centerstand and heated grips, the VFR800 Deluxe just took the Interceptor to a whole new level. The perfect complement to the Interceptor’s triple-disc-brake system, the Anti-Lock Brakes on the sportbike motorcycle provide the assurance riders want and need on unfamiliar roads, uneven road surfaces and compromised traction. Plus, Honda’s Traction Control system is designed to limit rear wheel slipping during a hard acceleration or during acceleration on low traction surfaces. It’s the added confidence that can only come from Honda track-tested, advanced engineering. Smart bikes have smart features. The VFR800 Deluxe outshines with self-cancelling turn signals that automatically self-cancel after they detect that you’ve completed a turn or a lane change. Taking off on a cold morning? Switch on the supersport motorcycle’s grip heaters for added comfort. Add to that a centerstand, and it all adds up to a highly versatile street bike motorcycle that is capable of sport riding as well as long-haul touring. Nimble, agile and a rider-friendly powerband, it’s the choice of riders who want it all. 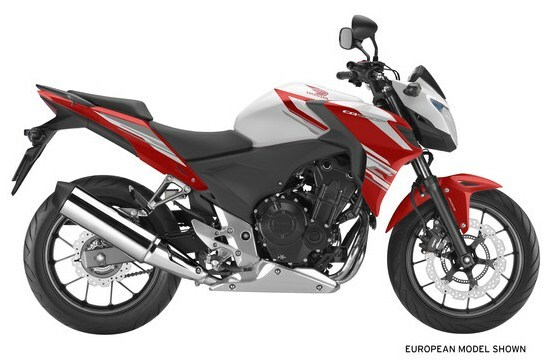 Honda’s new CB500F is the new, stylish, more comfortable, sport bike. With its sleek new look, the CB500F allows for riders to find a more comfortable and classic riding position while maintaining performance, because of the lower 30 inch seat, and it’s powerful 471cc motor. It is the perfect sport bike for riders who are looking to advance through a displacement class, as well as for anyone who enjoys stylish mid-weight motorcycles. The CB500F allows for riders to sit in a more upright position, allowing for a more comfortable riding and commuting, while also increasing passenger comfortability. In addition, the CB500F is lighter than other 500cc motorcycles, allowing for better handling, and for riders to more easily back it up into parking spots, as well as put it on its side stand. 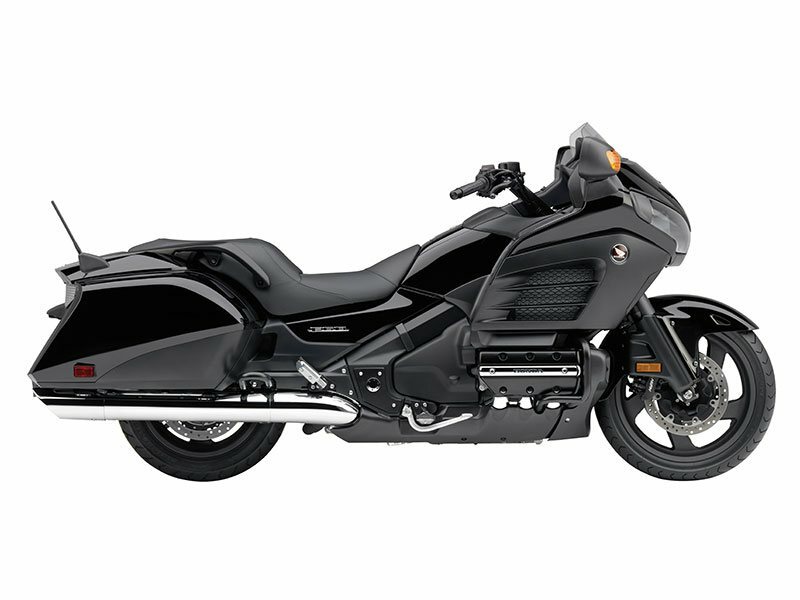 When you ride a VT1300CX ABS Fury, you’re the center of attention – whether you’re cruising through town or out on the open highway. Spanning nearly six feet from axle to axle, this is one long and lean machine. Best of all, you have two Fury custom motorcycles to choose from: Our standard VT1300 CX Fury, or the ABS version for riders who want an added level of stopping control in less-than-ideal environments. What makes the VT1300CX ABS Fury stand out? Let’s break it down. The standard – if you can call the Fury standard – integrates a single powerful 336mm-diameter front disc brake is complemented by a 296mm rear disc brake. With Honda’s innovative anti-lock brake system (ABS), cruiser motorcycle drivers have the added security and stopping power that only Honda engineering can deliver. After all, the road can throw anything at you – from wet pavement to sand and other debris on the road. ABS is designed to help custom motorcycle tires achieve optimal deceleration and stopping performance while preventing them from exceeding their limits of grip. As a result, it’s possible to maintain efficient and effective braking control over a wide variety of riding conditions. You have the added confidence when applying brakes in emergency maneuvers or on slippery roads. Simpler braking with the VT1300CX ABS Fury increases any riding enjoyment. Honda is known as the largest motorcycle manufacturer in the world nowadays, and its vehicles are greatly referred to as safe and reliable by a lot of individuals. And if you’re currently looking for a consummate Honda motorcycle experience in North Texas, Al Lamb’s Dallas Honda is the perfect answer for your concern since they’re one of the largest volume Honda motorcycle dealers in the United States. Since 1977, it is renowned as an exclusive Honda-only dealer in Dallas, Texas. They have a great selection of new and used motorcycles, dirt bikes, ATVs, scooters and more! They also have a good 35,000 square feet of showroom space dedicated to different vehicles they offer as well as personal watercraft, and power equipment. The dealership could really help you drive away on the perfect bike today! Does the motto “Fast, Fun, and Affordable” ring a bell to you? Perhaps you’ve heard it once or twice before, however, forgot the company it belongs to? From now on, you should remember that this particular motto belongs to the Al Lamb’s Dallas Honda. This official Honda Powerhouse dealer in Dallas, Texas offers a complete line of Honda powersports equipment exhibiting more than 80 various Honda motorcycles, cruisers, and more! Reviews of how great their team is are prevalent these days. They are described by many as omniscient individuals and proud motorcycle enthusiasts. It is apparent that each of them has an unbeatable knowledge regarding Honda accessories and service since they only focus on the Honda name brand. It is also considered as the best local resource for Honda motorcycles, ATVs, and dirt bikes in Dallas, Texas. Moreover, reviews claim that the team is always eager to get you riding on a Honda motorcycle, sports bike or scooter because it provides the best motorsports deals available in the region. The organization is also proud to have the top Honda parts in stock, reasonable financing, a professional motorcycle service department, and the most effective sales department around. If there’s one common thing that people kept on talking about on their reviews about the organization, it is probably the amazing facility they provide. If you’re worried about buying, reviews suggest that you shouldn’t because you could completely trust them with your purchase. So what are you waiting for? Drop by their site today at the Southeast Corner of 635 and Greenville Ave, or give them a call at 972-238-7148. You could also meet their dedicated Rider’s Club during the first Tuesday of each month at 7:00 pm. They’re open from Mondays to Saturdays from 9:00 am to 7:00 pm. After more than 3 decades of existence, it has become more successful through the dedication, perseverance, and hard work of their team. Reviews reveal that they’re always equipped with all the wisdom that could help the customers find a vehicle that matches their needs. They’re also making sure that the customers have the right resources, as well as the financial information, in order for them to make the best decision when purchasing a certain vehicle. With Al Lamb’s Dallas Honda, customers can choose from both new and pre-owned vehicles to find the perfect new motorcycles, scooters, or ATVs to enjoy. It also remains in contact with their customers to make sure that they’re delighted not only with their initial purchase but also with the Honda vehicle itself for years to come. As mentioned earlier, the dealership has outstanding sales, service, parts and accessories, and dealer support staff. Each of them has several years of extensive experience that’s worthwhile to the firm and to the customers as well. Included in this article are some of the notable members of the team: to begin with, we have the owner of the firm, Al Lamb. For over 30 years, Al is known by many for his constant commitment to the customers since he’s always making sure that they’re satisfied with their purchase. Second in our list is Colby McCaslin, the one who maintains all of the daily operations and responsible for the web maintenance. Third is the sales manager, Joe Gentle. He could help you with any of your motorcycle, dirt bike, scooter, ATV and UTV needs. He’s also keen on making your buying experience become more exciting and enjoyable. Need help for your specific accessory needs? The fourth one in our list could definitely handle that, his name is Baron Horton, the accessories manager. Fifth is Matt Blair, the OEM and hard parts manager who handles all of the shipping and receiving for the parts and accessories department. Sixth is Ted Poovey, the trustworthy service department manager who has an incredible talent for fixing things. The organization has a licensed state inspection station that could thoroughly inspect your vehicle. Its hardworking service technicians have years of broad experience and are Honda certified. Their lead service technician, also the seventh one on our list is Kirk Hantz. He has a huge collection in his tool box that he’s very proud of, so make sure that every time you visit the dealership, request for a look at his tool box since he also enjoys the chance to show it off to visitors. All of them are highly skilled and are Honda-trained, so it’s no wonder why it has a good reputation as a full-service Honda repair facility. Whether you just need a routine oil change or major repairs, they’ll get you back on the road or the racetrack as soon as possible! The last notable member in our list is Joe Fohn, the PDI Department technician. He handles the new unit pre-delivery and makes ready services. The dealership has truly enjoyed serving the Dallas community this past 38 years and they will continue to do so in the future. They’ve been the top local source for Honda powersports. It is also not just about creating a sale or service encounter with their customers, but they’re more focused on building a long-term relationship with them, so it’s no great surprise that the customers are enthusiastic to come back again and again. You should visit their website at http://www.dallashonda.com to see more great reviews about them made by their loyal customers. You can also find all the latest updates there. Al Lamb’s Dallas Honda is your best Texas Honda motorcycle dealer. With great deals and knowledgeable staff, they still remain the most reliable fast, fun, and affordable dealership in Dallas, Texas. The VT750 Shadow Aero is one of Honda’s most popular custom motorcycles on the road today. With classic styling from the spoked wheels, full fenders and chromed mufflers, the Shadow Custom Motorcycle offers breakthrough performance with a 745cc V-twin engine. It’s ten times the machine of most super-custom motorcycles without the huge price tag. Plus, it’s fuel efficient, too. Whether you’re on Main Street or the Interstate, you’re sure to turn heads with the VT750 Shadow Aero. Want the ultimate bike for cruising? Then there’s nothing like the power from a big V-twin engine. The Shadow Custom Motorcycle offers a 7545cc powerplant with plenty of torque and a wide powerband. Then there’s the custom 2-into-2 exhaust system that flows into bullet-style mufflers. You’ll notice the difference in the sweet sound that’s classic V-twin cruiser. The VT750 Shadow Aero sounds and rides as good as it looks. Settle into the comfortable, low-slung saddle at just 25.9 inches from the pavement, turn the ignition and set out for the open road. But no matter where your destination takes you, rest assured that the innovation of Honda engineering has you covered. The VT750 Shadow Aero sports a 296mm front disc for distinctly modern stopping power. After all, every rider knows the road can throw anything your way. Increase your confidence in any environment with Honda. Miles Per Gallon - 56 MPG - Honda's fuel economy estimates are based on EPA exhaust emission measurement test procedures and are intended for comparison purposes only. Contact Al Lamb’s Dallas Honda Now! If you’ve ever wanted to transport yourself into the future, this is your machine. By design, the NM4 shakes up the status quo and explodes conventional barriers in order to attract a whole new segment of forward-thinking riders to motorcycling. Beneath its futuristic bodywork there’s a 670cc, liquid-cooled, parallel-twin engine with four valves per cylinder, automatic dual-clutch transmission and ABS. Storage pockets in the fairing plus saddlebags add real-world utility, and the rear turn signals are neatly integrated into the rear bags. The rider settles easily onto a comfy seat that’s perched a low, 25.6 inches off the ground, and there’s also a cool and practical rider backrest feature—the passenger seat flips up and can be set at three different angles and slides fore and aft to one of four positions. Full LED lighting lets the NM4 stand out whether it’s coming or going, the fat, 200mm rear tire imparts a cool look, and the meter display can be illuminated in any of 25 different color choices—nearly one for every day of the month. Al Lamb’s Dallas Honda - With the Gold Wing 1800 F6B, Honda took the world’s best touring motorcycle a step further. Around the legendary liquid-cooled flat-six is a touring machine that’s lighter, trimmer and leaner. And with a lower overall weight, you can expect even more performance. 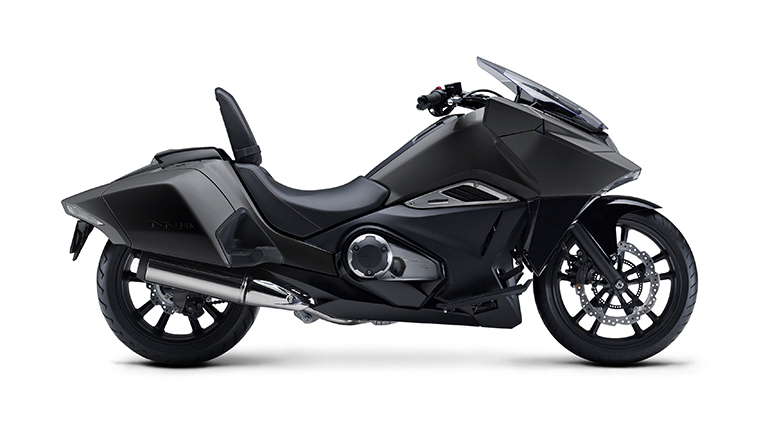 The radical new bodywork features a sleeker fuselage while still delivering the impressive engine and superior handling that make the Gold Wing one of Honda’s top-selling motorcycles. The F6B sports designed-in luggage, including twin-integrated saddlebags with 11 liters of storage each – both lockable and sealed to protect against the elements. A lower windscreen protects riders from the wind and weather by redirecting wind up and over the rider. Plus, it delivers a dependable – and linked – braking system. The F6B, like the GL1800, gets dual front 260mm rotors and three-piston calipers and a rear 316mm disc. Experience the innovations of the F6B, known affectionately as the Honda Bagger, for yourself and take it for a test run at Dallas Honda. This is a touring machine that’s perfect for a lazy cruise along a winding road or short trips around town. Settle into the rhythm of the road with the easy maneuvering, smooth operation, exhilarating acceleration and utmost reliability of the Gold Wing 1800 F6B. Miles Per Gallon - 34 MPG - Miles per gallon values are calculated estimates of fuel consumed during laboratory exhaust emissions tests specified by the EPA, not during on road riding. Use for comparison purposes only.